Everyone knows me for my famous from scratch, all homemade, comforting Apple Pie. In fact when falls peeks around, this is one dessert, I am vying to make over and over and over again! That’s when I remembered reading about French Apple Tatins and realized, I have to have a crack at it now! 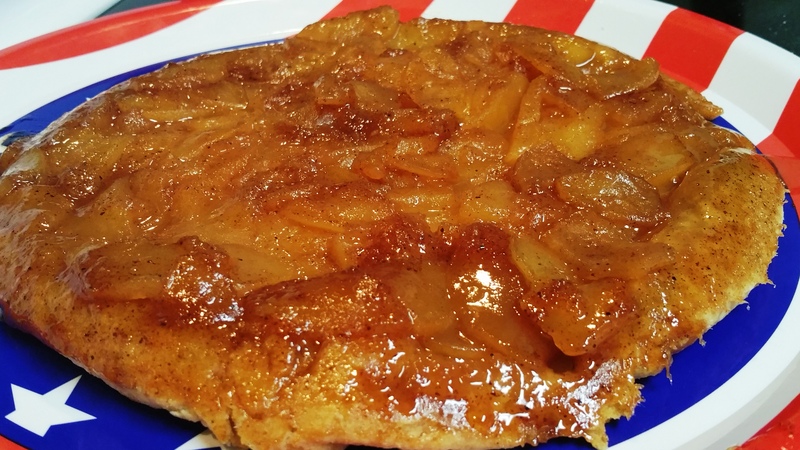 Onward I set, my first trial of an Apple Tatin and let me tell you – its is so much more easier to make than apple pie and so much more decadent that it as well! If you follow the recipe to a tee…I promise you, you will have a gorgeous, decadent, succulent dessert that not only screams fancy Parisian flair but makes your guests weak at their knees eating it. This Tatin is easy-peesy because you only make one layer of pastry and the filling is made in a skillet and baked in the oven. First, pulse in a food processor, the sifted flour with cubes of ice cold butter and salt. Slowly add 2-3 tbsp of water and stop pulsing once a crumbly texture is seen. Dump the mixture on a rolling board and knead the mixture to form a dough. Work quickly, keeping the bits of butter in shape as you work to form a dough. You need bits of butter in the dough to create a flaky pastry crust. Wrap the dough disc in a clingfilm and refrigerate for 1 hour. In a skillet, dab it with butter and under low heat, place 1/2 cup sugar and melt until it turns a beautiful amber color. In a colander, mix the sliced apples with 1/4 cup sugar, cinnamon, nutmeg and lemon juice and let it rest for 15 minutes. Once the caramel sugar starts bubbling, add 1 stick of butter (8 tbsp) and vanilla essence and apples and cook for 5 more minutes. Preheat oven to 375 degrees F. Once the filling has cooled down, roll out the pastry dough to a circumference few inches larger than the skillet and place it over the filling on the skillet. Tuck the pastry edges and crimp the edges with fork. Beat an egg and brush the top of the pastry dough to bake to golden perfection. Now place in the oven and bake for 20-25 minutes. Once the Tatin has cooled down, flip the skillet onto a serving platter and serve a slice with Crème Anglaise or Vanilla sauce or Vanilla ice cream or Whipped cream. Previous Where hath thou been? And A Fiery Soup To Soothe Your Very Soul!